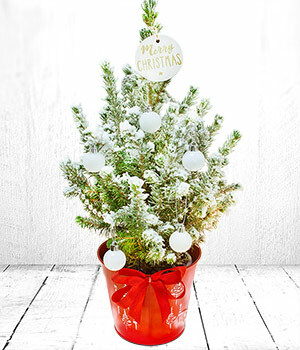 Sprinkled with fake snow, and accompanied by a little red pot to call home, this Christmas Tree is the perfect alternative to the real thing. Standing at approximately 50cm this Christmas Tree will add a touch of festivity wherever you are based, it’s ideal for your best friends desk at work, or that corner of your home that needs a little bit of brightening up for the Christmas season! Baubles shown in the product image are for display purposes only and not included with the tree.